Interrupting is a skill. Some people have a hard time interjecting at all. Others have no regard for the person talking and just talk over them. Somewhere in the middle is the well-timed interruption. Maintaining your focus despite interruptions is also a skill. Not getting derailed, keeping on topic, and maintaining control of the conversation are important things to know how to do. If you have any doubt, here’s an interesting article on gender differences in conversation habits. 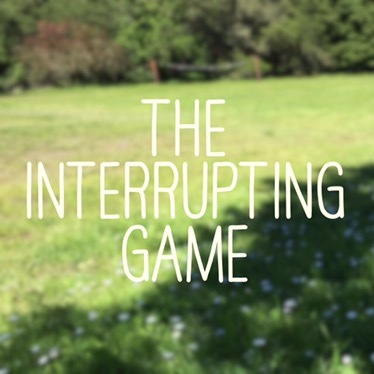 The interrupting game goes like this: There is a talker and an interruptor. The talker is talking, and the interruptor interrupts, with the intention of derailing the conversation. If they are successful, they get points. (No, the points aren’t worth anything more than kudos.) However, if the talker catches the interruption and politely asks the interruptor to save the thought for later, then the talker gets points. The interruptor can choose to listen or not. If they don’t, then the talker can get more points by completely ignoring the interruptors bids for attention. Finally, when the talker gets to a breaking point in their conversation, they have a third chance to get points by bringing the focus back to the interruptor and giving them a turn to speak. My kids are loving this game. They like the green light to try to interrupt. They like the green light to not listen when I say to wait. They love when I give them “points” after they’ve successfully derailed me. I am loving this game. I love not feeling guilty asking them to hold their thought. I love being free to completely ignore and talk over them while they jabber nonsense (literally) at me. I love giving them a turn to talk afterwards, and being able to totally focus on them. And I’m looking forward to finding some great phrases for holding control of the conversation. “Stop interrupting me” from the article linked above, “I’m not done talking” and “wait, I’m still in the middle of talking” are my current favorites.